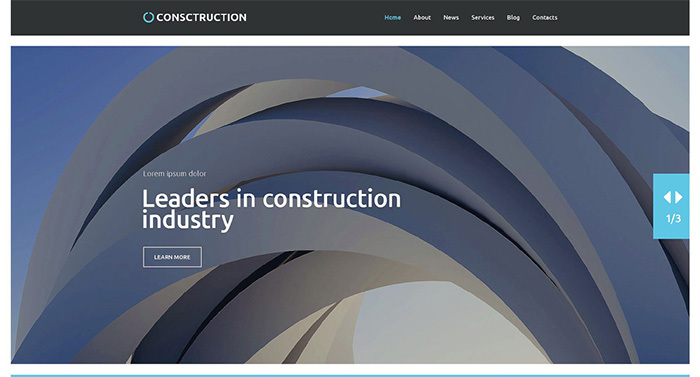 Construction companies, just like any other contemporary business, need to look smart and trendy on the web. 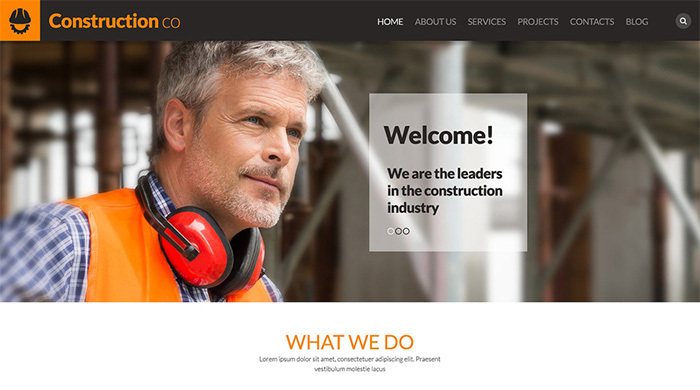 With the purpose to help you update construction and design web projects with style, we have decided to come up with this compilation of the 20 freshly-crafted WordPress templates. All themes from the compilation are TemplateMonster’s brainchildren. All of the highlighted themes saw the light of the day in 2016. The design of every template is crafted as per the latest web standards. Running on fully responsive frameworks, all templates are enhanced with Cherry Framework features, providing with webmasters with worry-free installation and modification of ready-made designs. Just like all the rest of WordPress themes released by the company, these 20 newly launched designs are pre-loaded with detailed documentation and free 24/7 support. 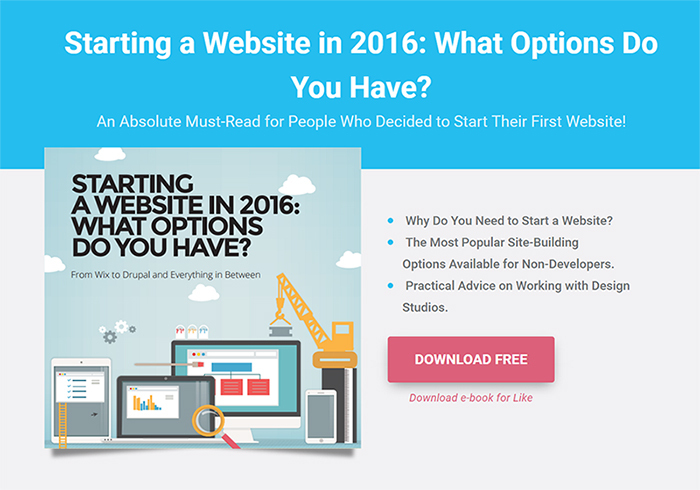 All owners of WordPress themes can benefit from free educational materials for startups, as well as eBooks. YouTube video guides on the customization of premium WordPress templates are also at your disposal. So, you can use any or all of freebies to get the most out of the chosen theme. 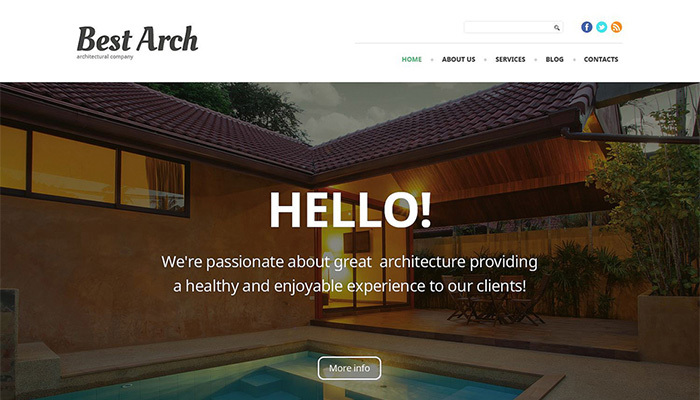 The theme is hand-crafted to match a variety of design and architecture web projects. Pre-loaded with a number of cool visual effects, the template is intended to bring the users’ eye to your company’s projects primarily. The latter are features in sliders, galleries, and backgrounds of the template. Statistics, social media options, and contact details are clearly defined on the theme’s front page. Google map widget can be found at the very bottom of the template. 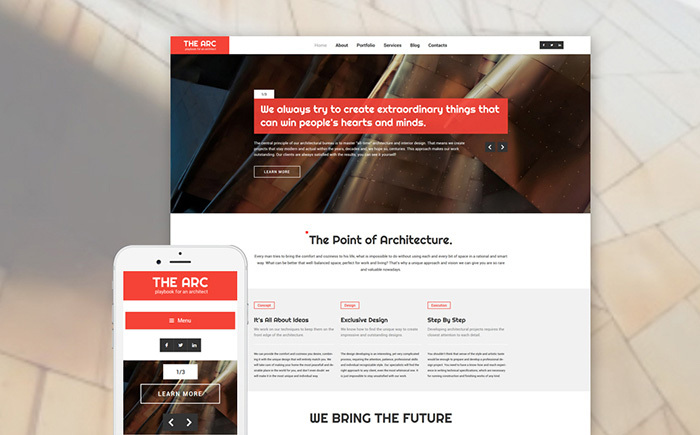 If you are looking for a clean architecture template designed in flat style, take a closer look at The Arc. Clear and concise presentation of the content makes it easier to deliver the company’s message to the target audience. Sliders and photo galleries look outstanding. Hover effect allows you to reveal more information about a certain project while putting a mouse-over the images. 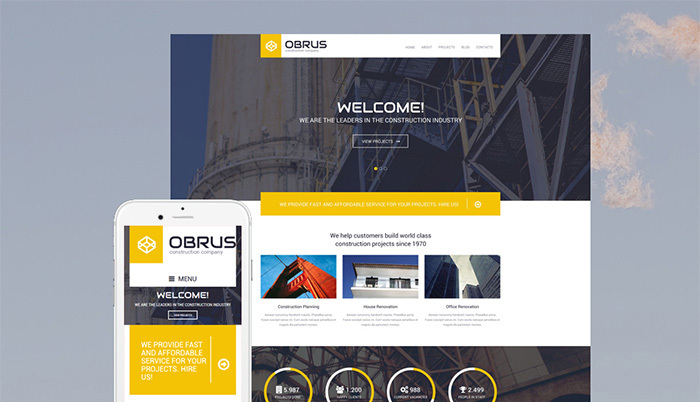 A clear and concise layout of the template is intended to bring a sleek and professional presentation to a number of architecture and business web projects. The layout is quick and effortless to navigate. The main navigation panel is sticky, providing the users with quick access to any of your site’s content. 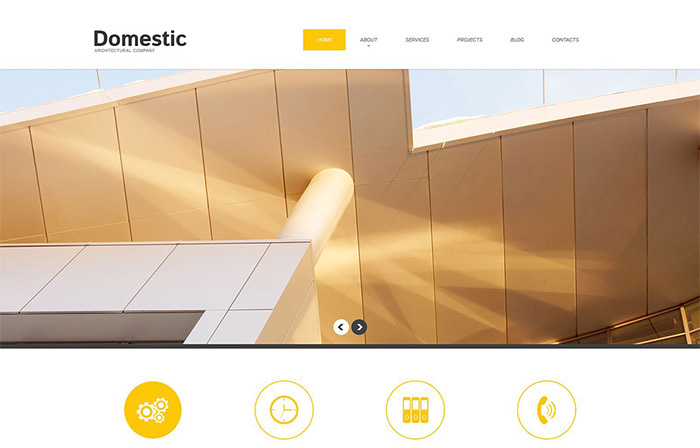 Placed on dark-colored backgrounds, photo galleries and bold yellow CTAs look outstanding. The theme’s layout makes heavy use of images. The latter are features in the header slider, card-based gallery, and a grid-based list of services. Thanks to the image hover effect, you can make the presentation of your business far more effective. The theme features blog functionality as well. Ready-made blog layouts are ready to go live out-of-the-box. If you need a ready-made template to bring a highly informative and user-friendly web resource live, look no further. The given template was built with attention to details. The pages are quick to scan even for the first-time visitors. Alongside with effective content presentation, the theme includes a highly informative footer section containing quick links to the rest of the site’s pages as well as contact details. The theme looks simple yet effective. The layout is built in neutral, easy-on-the-eyes colors, bringing the main focus of attention on the content provided on the page. The latter make up a perfect balance of visual and written data. Background images feature the parallax scrolling effect, adding more depth to the layout. 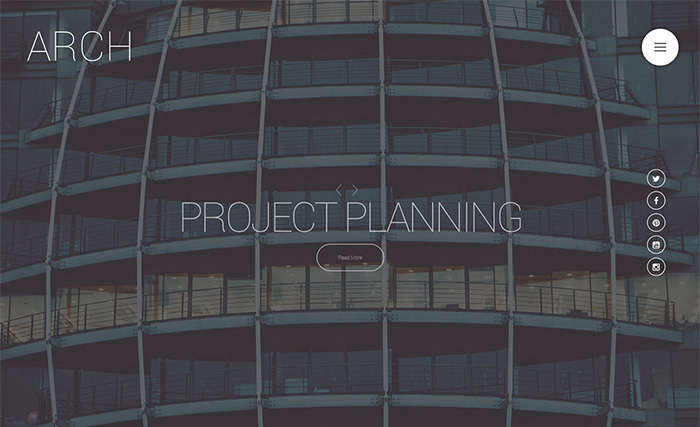 The theme is designed to bring the visual presentation of your projects in the spotlight. Retina ready images are added to theme’s slider, backgrounds, galleries, and content blocks. Thanks to the parallax scrolling effect, the users can feel like they are part of your business. Clear content structure ensures that people will feel the ease of coming across the necessary piece of information. 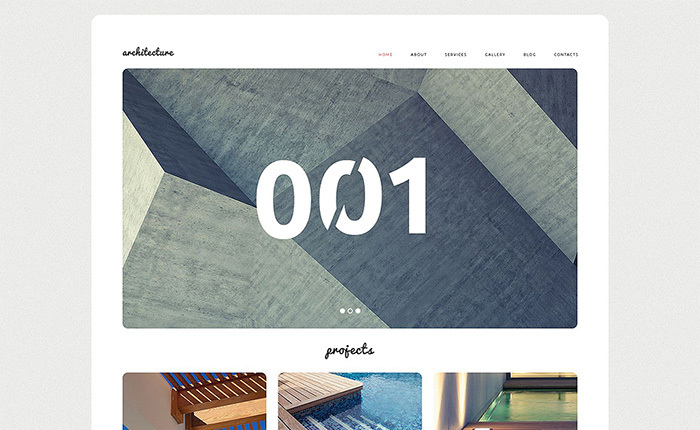 Make use of this theme to update the presentation of your personal or business projects with trendy metro style. Bold and catching multicolored polygon elements are featured everywhere on the theme – from the navigation panel to the backgrounds. A multi-layered menu is minimized and presented in the form of a sticky hamburger icon. 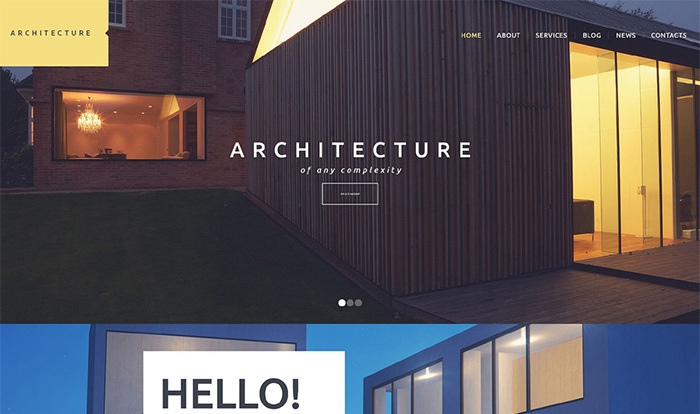 Flat style of this theme brings the visual content in the focus of attention. A creative portfolio featuring the most impressive projects of a brand standing behind the site is organized into tiles. Each image is enhanced with a functional hover effect, revealing additional information about a chosen project on the mouse-over. A sticky drop-down menu facilitates navigation. 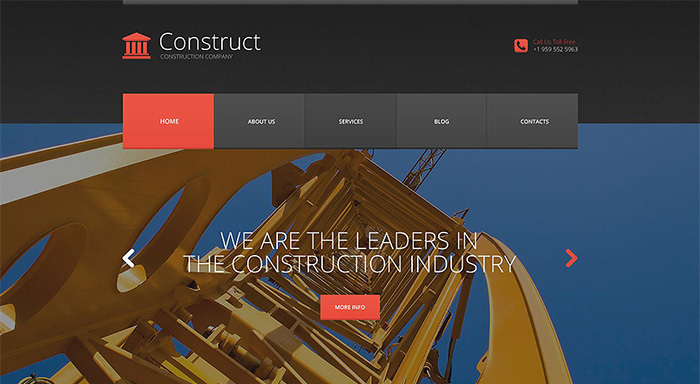 This user-friendly template is designed to match both construction and business sites. Designed in a sleek and professional style, it runs on the mobile-friendly Cherry Framework 3. The latter provides webmasters with a host of pro customization options, including a set of shortcodes and widgets. Thus, you can bring the desired look and feel to your web project in the shortest period of time. 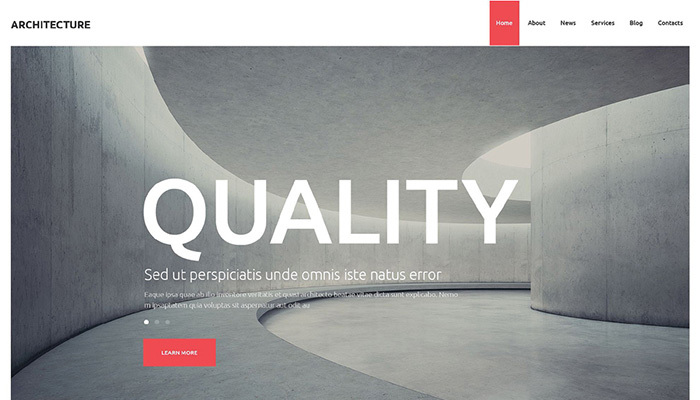 The theme features a simple yet functional style. Clean design brings the content to the forefront. A fixed navigation panel lets the users access any page of the site without the need to navigate to the header. 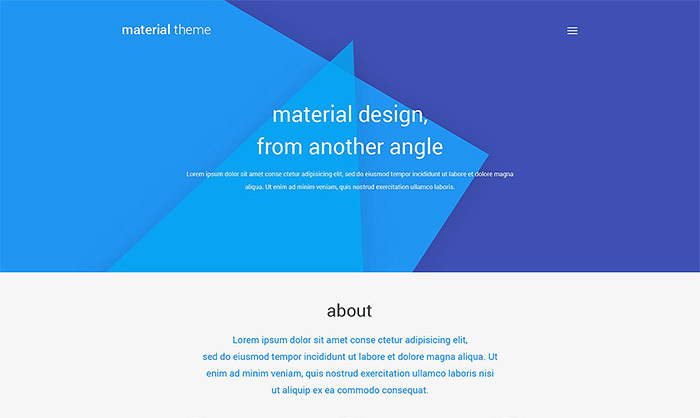 A page-width header slider serves as a cool visual trigger, introducing the users to your featured content. The theme is built in a simple yet functional manner. The front page brings a company’s works in the spotlight. Organized into sliders and galleries, they are a pleasure to navigate. All featured projects are enhanced with a Quick View feature, letting the users take a closer look at the preferred works. The theme is rich in images. Still, this fact doesn’t make it slow. The integration of lazy load effect makes all content load lightning-fast as a users browsing the site’s data. The front page is made up of page-width photo backgrounds. 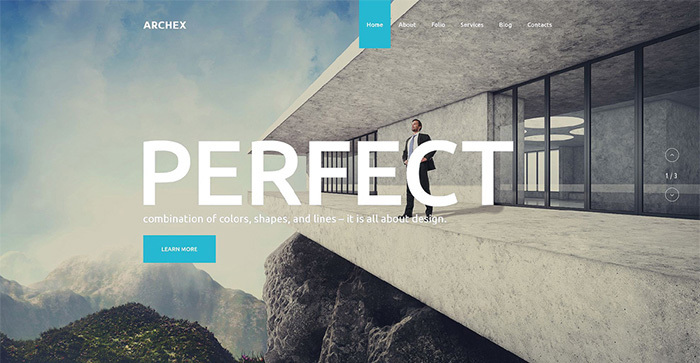 The parallax scrolling effect makes the design far more interactive and captivating. The theme is designed to make a number of online businesses look sleek and professional. Flat style brings the content to the spotlight. Niche-specific icons enhance the theme’s navigation. 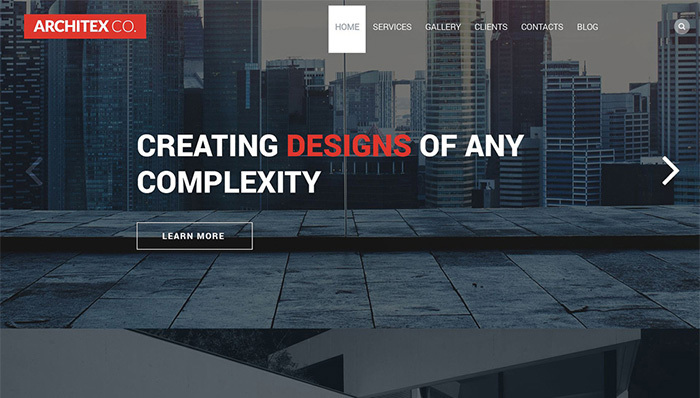 Well-balanced layout structure and a smart use of whitespace enhance the theme’s usability, letting the users come across the desired piece of content in a glance. The theme is intended to display your craftsmanship in a striking style. A handful of gallery scripts will assist you in a more remarkable presentation of your site’s content. 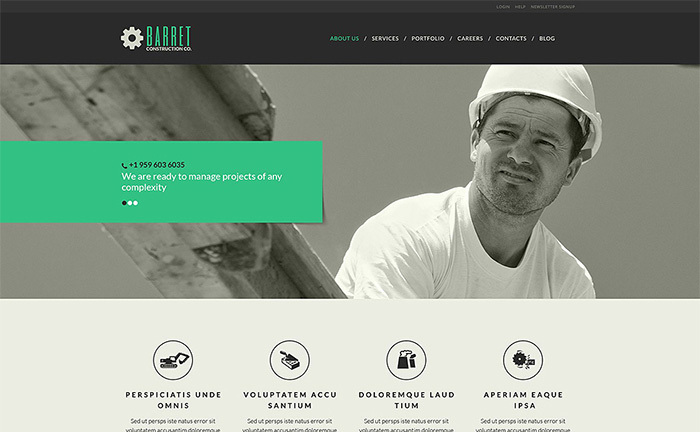 Built in clean style, the layout brings the main focus of attention to the visuals and the basic navigation elements. 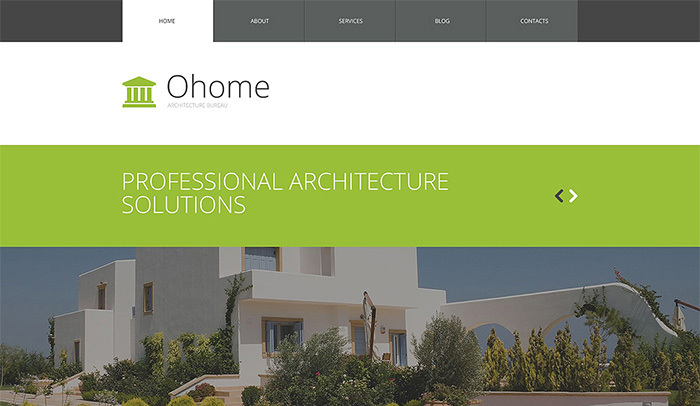 Developing a web page on the basis of this ready-made theme, architecture companies may be certain that their online presentation will look trustworthy and professional in the eyes of the online community. WPML support allows site owners to reach international clients with ease. Custom page templates, various post types support, and a fully editable interface make it far easier to tweak the theme to match your corporate style. Hand-crafted with attention to details, the template boasts a powerful yet intuitive interface, letting even web design beginners bring a sleek and professional presentation to their online projects. A handful of customization options make this design applicable to a variety of purposes – from freelance designers to large construction companies. By means of this template, construction and architecture businesses can draw special users’ attention to their projects and services. The theme is pre-loaded with a set of custom page templates, letting you get started with an online business in a short run. All elements of the theme’s layout are fully editable and highly usable. 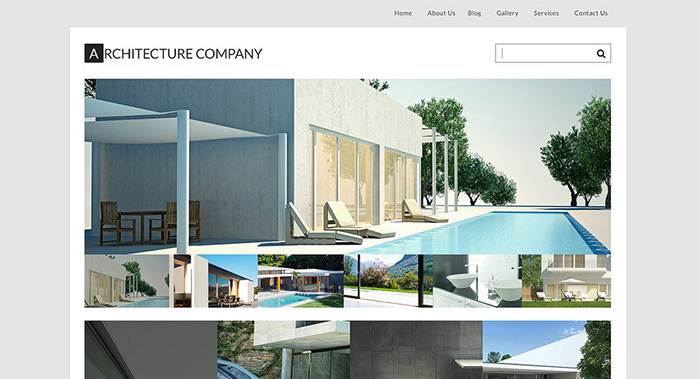 The projects page features a filterable gallery, enhancing the users’ browsing experience. Black-and-white elements of the template are painted in colors on the mouse-over. 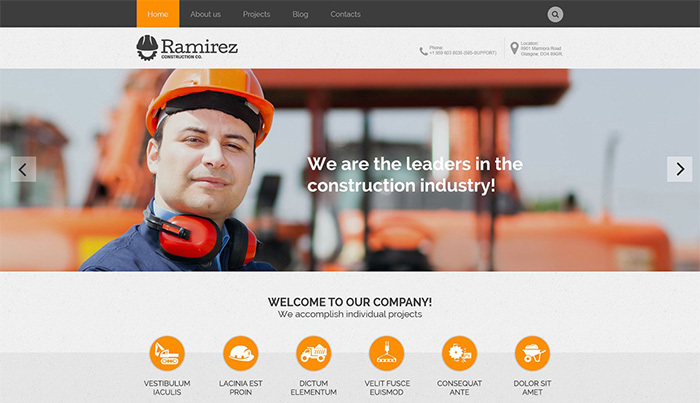 Featuring a clear and concise layout, the theme is specifically developed to bring a smart, modern-looking presentation to a number of online business projects. 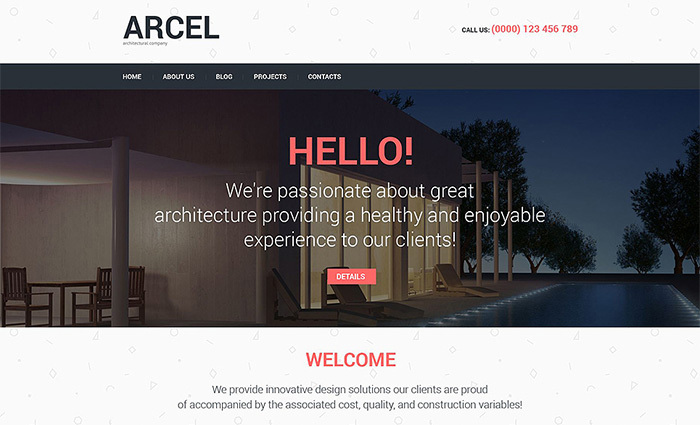 Alongside with an impressive presentation of services and portfolio, the theme features a highly usable and intuitive navigation. 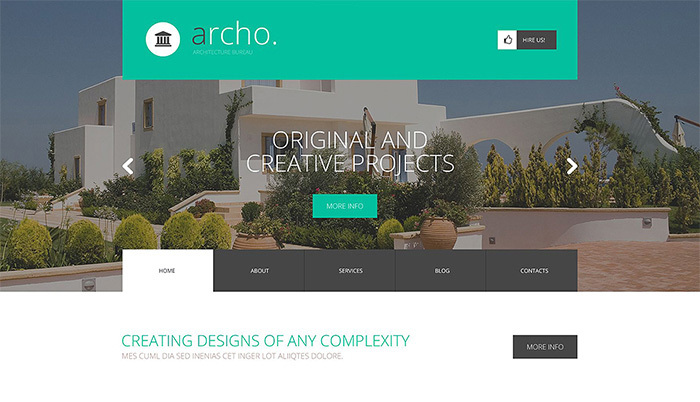 Fair design of this template will bring special charm a more aesthetically pleasing look to architecture and construction online businesses. It features pre-designed pages for presenting a company story, its services, projects, and contacts in a user-friendly style. A built it blog functionality and a pre-designed blog layout allows the theme’s owners to start sharing their stories straight away.